The definition of versatility, this ultralight 2-in-1 adapts to your business with 4 flexible modes to work, present, create, and connect. Features a stunning display with intense color and deep contrast. Even a dockable, rechargeable stylus pen. Thin and light 14" 2-in-1 convertible, the ThinkPad X1 Yoga supports four flexible usage modes for when you want to work, present, create, and connect. The full-sized, backlit keyboard is spill-resistant and the keys retract automatically when not being used as a laptop, so they are not exposed when the keyboard is face-down on a desk or table. Plus, the X1 Yoga is tested against military specifications and made to endure extremes. Yet for all its durability, it weighs just 2.8 lbs / 1.27 kg, making it one of the world's thinnest and lightest 14" 2-in-1 business laptops. Like the rest of the X1 family, this convertible Ultrabook™ is thin, light, and tough. 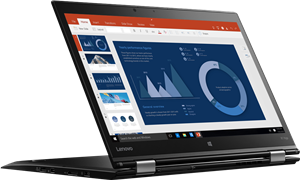 The thin X1 Yoga features a 14" 2K (2560 x 1440) touch screen display, with optional OLED technology. The X1 Yoga lightweight 2-in-1 laptop includes a dockable stylus pen that recharges when connected—just 15 seconds of charging gives 100 minutes of use. And because it docks into the laptop, you can keep it handy for when you need it for drawing, annotating documents, or making notes.